Shah Safi / Shah Sofi pearl is one of the largest single pearls in the world, weighing approximately 500 grains, and discovered in the Persian Gulf in the 17th-century. Information on this pearl comes to us from the book of travels "Le Six Voyages de J. B. Tavernier - The Six Voyages of J. B. Tavernier" published in 1676 by Jean-Baptiste Tavernier. Tavernier referred to this pearl as "the largest and most perfect pearl ever discovered, and without the least defect." He also represented this pearl as a sketch in his book, one of five such sketches of principal pearls that came under his careful observation. According to Tavernier, the pearl was the valuable possession of the bloodthirsty Safavid Shah of Persia, Shah Safi / Shah Sofi, who succeeded Shah Abbas I, and ruled from 1629 to 1642. The pearl was purchased by Shah Safi from an Arab in 1633, who had received it from the pearl fisheries of El Katif in the Persian Gulf. The King purchased the pearl for 32,000 tomans of Iranian money, equivalent to 1,400,000 livres of French currency at that time, which according to George Frederick Kunz was equivalent to $552,000, as stated in his book "The Book of the Pearl." Thus, the pearl gets its name from its one-time owner, Shah Safi of Persia. Any information on the characteristics of this important pearl only comes from Tavernier's description and the sketch he had made of this pearl. Tavernier appears to have had the privilege of examining this pearl during one of his voyages, which invariably passed through Isfahan, the capital of Persia in the 17th-century, one of the key transit points on the land route from the west to the east and vice versa. Unfortunately, Tavernier failed to mention the weight of this pearl. The weight of the pearl, given as approximately 500 grains, is actually an estimation made by George Frederick Kunz, in his book "The Book of the Pearl," based on the sketch of the pearl, which was Figure 1, on the diagram, in Tavernier's book. Jean-Baptiste Tavernier- Dressed in the robes of honor presented by Shah Abbas II of Persia. The shape of the pearl was described by Tavernier as pear-shaped. This observation combined with his comment that this pearl was "the largest and most perfect pearl ever discovered, and without the least defect" seem to suggest that the pearl was a perfect pear-shaped drop pearl like the 302.68-grain La Regente or the 223.8-grain La Peregrina pearls. The color of the pearl is also not mentioned by Tavernier. However, the pearl no doubt is a saltwater nacreous pearl as it was discovered in the Persian Gulf. Based on this fact and the same glowing comment of Tavernier, it can be assumed that the pearl had a color, luster and overtone, commensurate with its status as the most perfect saltwater pearl ever discovered. Thus it may not be far-fetched to assume that this pearl was a white pearl, the most sought-after color in pearls, with a silver overtone, and a brilliant luster characteristic of saltwater pearls. The phrase "without the least defect" is an apparent reference to the excellent surface qualities of the pearl, which was perhaps totally blemish-free. The position of the Shah Safi / Shah Sofi Pearl in the table of famous nacreous pearls in the world. In the table of famous nacreous single pearls in the world arranged in descending order of weights, the Sha Safi / Sha Sofi Pearl occupies the 8th position. Thus the pearl is the 8th-largest single nacreous pearl in the world. Based on its general shape- drop shape - the Shah Safi / Shah Sofi Pearl is the 4th-largest drop-shaped pearl in the world. Based on the type of drop-shape - pear-shaped drop - the Shah Safi / Shah Sofi Pearl is the second largest pear-shaped drop pearl in the world, the first-largest being the 504-grain Gogibus Pearl. See table below. According to Tavernier the Shah Safi Pearl originated from the pearl fisheries of El Katif, which was an ancient and renowned pearl fishing grounds on the western shore of the Persian Gulf, on the eastern coast of the Arabian peninsula, in the Gulf of Bahrain. 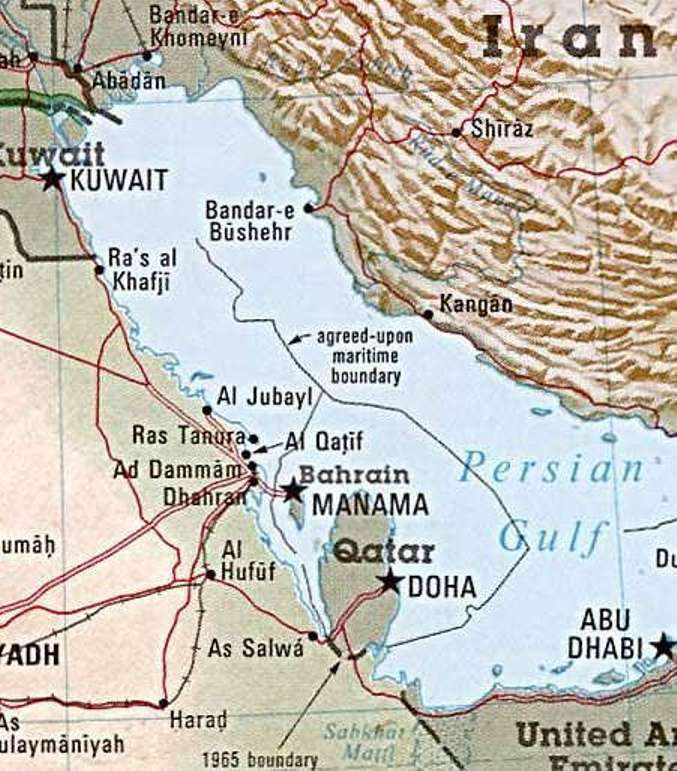 The richest pearl resources in the Persian Gulf was concentrated around the islands of Bahrain, which in ancient times was known as Tylos by the Romans. The El Katif pearl fishing grounds was situated on the other side of the Gulf of Bahrain, closer to the eastern coast of the Arabian peninsula, on the opposite side of the rich pearl banks of Bahrain. Map of the Persian Gulf, showing the east coast of Saudi Arabia, Al Qatif and Baharain. The pearl resources of the Persian Gulf were well known during the days of Pliny, who in his book "Historia Naturalis" states, "but the most perfect and exquisite pearls of all others, be they that are gotten about Arabia, within the Persian Gulf." Pliny also states that Catifa (El Katiff), on the Arabian coast off Bahrain, was the center of an important fishery. 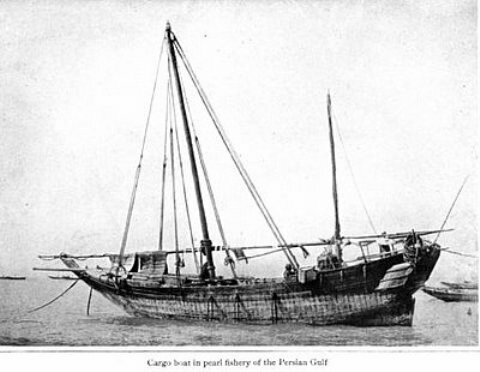 The pearl fisheries of the Persian Gulf around Ormuz, the fortified port city on the Island of Ormuz, on the Persian side of the Straits of Ormuz, came under the control of the Portuguese in 1508. The Portuguese also occupied Muscat in 1508, and gradually extended their control over the entire pearl fishery of the Gulf. They captured Bahrain in 1521, taking control of the most productive pearl fishery in the Gulf, situated around the island of Bahrain. They imposed heavy taxes on the pearl fisheries throughout their period of control of over a century. J. H. van Linschoten who visited the Persian Gulf pearl fisheries in 1596, when they were under the control of the Portuguese, wrote, "The principal and the best that are found in all the oriental countries, and the right oriental pearls, are between Ormus and Bassora in the straights or Sinus Persicus, in the places called Bareyn, Catiffa, Julfar, Camaron, and other places in the said Sinus Persicus, from whence they are brought into Ormus." Tavernier's comments about the pearl fishery in Bahrain and "El Katif"
Portuguese control of Bahrain, lasted for 80 years until 1602, when they were ousted by Shah Abbas I of the Safavid dynaty of Iran. They were ousted from the Island of Ormuz in 1622. However, the Portuguese were completely driven out of the Persian Gulf region only in 1648, after they were ousted from Oman by the different Arab tribes of the region. 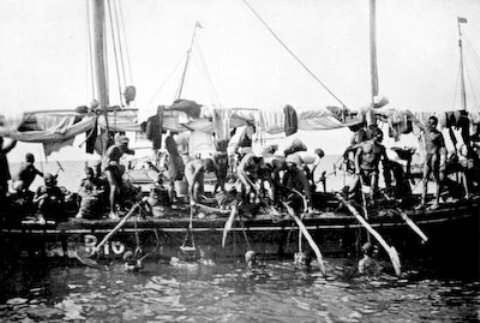 Tavernier also gave an account of the pearl fisheries of the Persian Gulf in his book "Le Six Voyages de J. B. Tavernier- The Six Voyages of J. B. Tavernier" published in 1676 :- "There is a pearl fishery round the island of Bahren, in the Persian Gulf. It belongs to the King of Persia, and there is a good fortress there, where a garrison of 300 men is kept. When the Portuguese held Ormuz and Muscat, each boat which went to fish was obliged to take out a license from them, which cost fifteen abassis, and many brigantines were maintained there, to sink those who were unwilling to take out licenses. But since the Arabs have retaken Muscat, and the Portuguese are no longer supreme in the Gulf, every man who fishes pays to the king of Persia only five abassis, whether his fishing is successful or not. The merchant also pays the king something small for every 1,000 oysters. 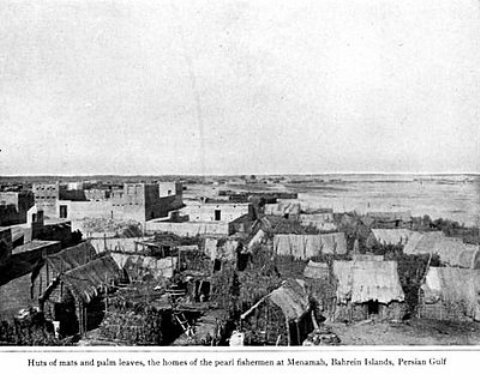 The second pearl fishery is opposite Bahren, on the coast of Arabia-Felix, close to the town of El Katif, which with all the neighboring country belongs to an Arab prince. Katif is a historical coastal city, located in the midst of one of the largest oases in the world, on the western shore of the Persian Gulf in the eastern province of Saudi Arabia. The history of Katif dates back to the late Bronze age, around 3,500 B.C. An ancient state based in Bahrain during this period, also included the region of Katif and was mentioned in the texts of the Assyrians, Acadians and Sumerians, and was subject to the rule of the Acadians and Babylonians. The region also came under the rule of the Assyrians from 1000 B.C. to 600 B.C. Katif was also well known to the ancient Phoenicians and Greeks, and played a role in the history of these civilizations. From around 250 B.C. until the arrival of Islam in Arabia in the 7th-century A.D., the entire Arabian side of the Gulf from Basra to Oman, including El Katif and the Island of Bahrain came under the control of the Persian ruling dynasties of Parthians and Sassanids, which helped them to control the trade routes operating through the gulf region. With the advent of Islam in 622 A.D., El-Katif on the Arabian coast of the Gulf was among the first to embrace Islam, after a letter of invitation sent by Prophet Muhammad (S.A.). The people of Katif sent a delegation to the Prophet (S.A.) and joined Islam. The Prophet (S.A.) praised the people of Katif for their strong faith and support for Islam during its initial phase. The Arab inhabitants who settled in El-Katif (Al-Khatt), Hajar (Al-Hasa) and Awal (Island of Bahrain), which constituted the larger Bahrain in ancient times, were the descendants of the Arab tribe Bani Abd al-Qais. In 1521, when the Portuguese took control of Bahrain, El-Katif also came under their control. It is believed that the "Tarut Citadel" in Katif was built by the Portuguese for protection against Turkish attacks. The citadel is surrounded by a wide wall of terracotta, gypsum and stones. The wall is 9 meters high and 1.0 to 2.5 meters in width. Bridges over the entire length of the wall, connects 11 high towers and abutments, and were used a secret passages during wartime. The Portuguese however, were expelled from Katif in 1559 A.D. and eventually from Bahrain in 1602. The prominent location of El-Katif in the Persian Gulf, and its rich natural resources, including pearls made Katif famous since ancient times. The Greeks called it "Cateus" and some early European maps labeled the entire Persian Gulf as the "Sea of El Catif." The ancient historical roots of Katif are clearly reflected by the many castles, citadels, ancient ruins and cemeteries scattered across the region. Katif also played a key role in the east-west trade route, serving as a trading outpost and a transit point for the east-west trade in spices, originating from the Indian sub-continent. Ships carrying spices from the west coast of India, sailed through the gulf, and unloaded their cargo at Katif for their onward land journey to Europe. Trading ships also called at Katif for food and water, and other trading negotiations. Katiff was also famous for its war industry during ancient times, producing one of the strongest weapons of ancient warfare, the "Khutti Spears" favored by the strong and mighty knights. Agriculture and fishing were the main economic activities of the people of this region since very ancient times. Besides, pearl fishing was also an important economic activity in which many people of this region were engaged in. However, the development of El-Katif as a port city, and a transit point for trading activities in the East-West trade route, was one of the main reasons that made this region affluent in the past. However, today the discovery of oil in the region and the development of oil fields, have added a new dimension to the economy of this region, which is both petroleum related and agriculture based. Fishing is also still pursued, and the Katif fish market is the largest market in the Kingdom of Saudi Arabia as well as the Gulf. Most of the fish caught in the gulf region enter the Saudi markets through Qatif. The modern city of Katif is connected to other urban centers of Saudi Arabia by highways, and is close to the causeway to Bahrain. However, today the capital of the Eastern Province of Saudi Arabia is Dammam, whose airport, the King Fahd International Airport, also serves the Katif region. The species of oyster inside which the Sha Safi pearl originated is the Persian Gulf oyster, Pinctada radiata, which historically was the most prolific pearl producing oyster species, around which the ancient natural pearl industry of the world was based. The hub of the ancient international pearl industry was the Persian Gulf, the Red Sea and the Gulf of Mannar. The oyster species found in these waters, was Pinctada radiata, even though there were minor regional variations in the species. This species produced significant quantities of seed pearls, less than 2 mm in size. But, they also produced medium-sized pearls, ranging in size from around 3 mm to 10 mm. The species also produced occasional large pearls greater than 10 mm in size, such as the asymmetrical drop-shaped "Pearl of Kuwait with dimensions of 41 mm x 19 mm, the garden-egg shaped "Pearl of Asia" with dimensions of 76 x 50 x 28 mm, and the baroque drop-shaped "Hope Pearl" with a length of 50 mm. The dimensions of the "Shah Safi Pearl" is not known, but only its estimated weight of around 500 grains. A pearl of this enormous weight no doubt has large dimensions, and an idea of this dimension can be obtained by comparing it with another pearl of almost similar weight, viz. "the Gogibus Pearl" which has a weight of 504 grains, and dimensions of 63 mm x 50 mm. Pinctada radiata grows to a maximum size of 70 mm to 80 mm. Thus, it is quite possible that some of these large pearls could have originated in this species. White and yellow are the common body colors of pearls produced by Pinctada radiata. Silver, cream and pink are overtone colors. Thus, the combination silvery-white, yellowish-white, and pinkish-white are common colors among these pearls. Being saltwater natural pearls, made entirely of nacre, the luster and orient of these pearls, caused by reflection and refraction of light respectively, are also exceptional. According to Tavernier, the Sha Safi pearl was purchased by the bloodthirsty Shah Safi, the King of Persia in 1633, from an Arab who had just received it from the pearl fisheries of El-Katif, for 32,000 tomans. A short biography of Shah Safi, would convince the reader to what extent Tavernier was correct, in characterizing Shah Safi as bloodthirsty. Sha Safi who was the sixth ruler of the Safavid dynasty, was Shah of Iran from 1629 to 1642. 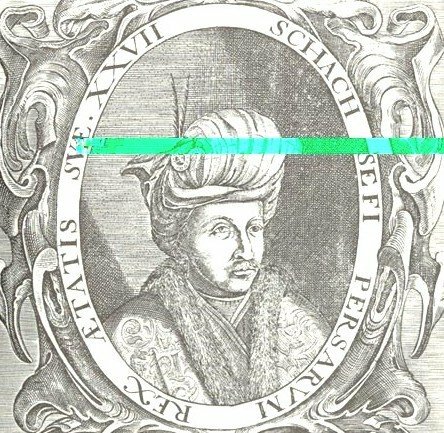 Shah Safi was the grandson of the powerful Shah of Iran, Shah Abbas I, who successfully fought and re-captured Iranian lands seized by its neighbors, the Ottomans Turks and the Uzbeks, as well as the Mughals and the Portuguese. Shah Abbas was able to dislodge the Portuguese from Bahrain in 1602 and the Island of Hormuz in 1622. His reign extended from 1587 to 1629. Shah Abbas chose his eldest son, Mohammed Baqir Mirza, the son of his Georgian wife Dilaram Khanun as the Crown Prince and successor. However, in 1615 Shah Abbas I got his eldest son and crown prince killed, fearing that he was plotting against him to take over the throne. He then appointed his second son Mohammed Khodabanda as his successor, whom he later got blinded in 1621, as he was too hasty and began to celebrate his accession to the throne, while Shah Abbas was on his death bed, from which he miraculously recovered. He then appointed his 3rd son Imam Qoli Mirza as his successor, who too was partially blinded and imprisoned in 1627. Shah Abbas, thus having eliminated his own children from succession, was forced to look for a successor from his grandchildren. Thus, in 1627 he chose his grandson Sam Mirza, the son of the murdered Mohammed Baqir Mirza as his successor. It is said that Sam Mirza was a cruel and introverted character who loathed his grandfather, because of his father's murder. Finally, when Shah Abbas died in 1629, he was succeeded by Sam Mirza in 1629, who took the name Shah Safi. 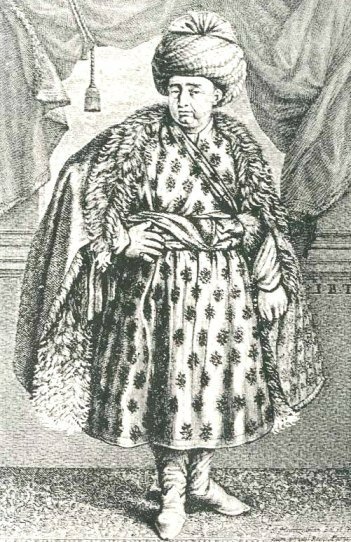 Safi was crowned as the Shah of Iran on January 28, 1629, at the age of 18 years. Like his grandfather, he too ruthlessly eliminated anyone, whom he regarded as a threat to his power. Thus he executed almost all the Safavid royal princes, as well as leading courtiers and generals. Safi, who did not have a proper education, had no cultural or intellectual interests. He entrusted the governance to his Grand Vizier, Saru Taqi, who was efficient and incorruptible, and became the dominant political figure of Safi's reign. Thus, Shah Safi took little interest in governing, instead spending his time drinking wine or taking opium for which he developed an addiction. However, his abhorrence of tobacco smoking, like his grandfather defies explanation, and he even went to the extent of killing people who were caught smoking in public, by pouring molten lead in their mouths. Unlike his grandfather, Shah Safi was a weak ruler, and whatever territorial gains made by Shah Abbas I, during his reign, was eventually reversed during the reign of Shah Safi. In 1638, Iran lost Baghdad to the Ottoman empire and Kandahar to the Mughals. Iran was also troubled by the Uzbeks and Turkmens in the east. Shah Safi died in 1642 and was succeeded by his son Sultan Muhammad Mirza, who was less than 10 years old, and took the name Abbas II. Saru Taqi continued as Grand Vizier and regent to the minor king, and as usual continued his drive against corruption, making many enemies in the army, who finally assassinated him in 1645. Saru Taqi was succeeded by Khalifa Sultan as Grand Vizier. Thus, Tavernier's characterization of Shah Safi as bloodthirsty is an accurate estimate of his character. However, Shah Safi seems to have inherited this behavior from his grandfather, Shah Abbas II, who too was bloodthirsty and eliminated his own children. This type of bloodthirsty behavior and the killing of one's own blood relatives, was common among the monarchies of the Muslim empires in the past, such as the Ottoman empire, the Persian Empire, the Mughal empire in India etc. One reason for this behavior of Muslim monarchies, was the lack of an accepted system with religious backing for royal succession, as it was practiced in the West, which would have minimized such unacceptable behavior by monarchs, killing their own children. Can this be a draw back in the religion of Islam, which claims to be a world wide religion for all times ? The answer is an emphatic no. The Prophet of Islam was not only the founder of a religion, but also a Head-of-State. During his lifetime as the Prophet of Islam, and his tenure as Head-of-State, the Prophet of Islam set the guide lines of the modern Islamic state, which did not envisage a monarchy, and hence their was no need for rules of succession to be specified. In other words the Prophet of Islam, clearly opted for a republican form of government as opposed to the monarchies that was prevalent elsewhere in the world, including the west. During his tenure all important political decisions of the prophet were taken by consensus, carrying all shades of opinion together, after due consultation with his closest companions. Thus, the Holy Prophet of Islam did not have to specify any terms of succession after his death, as his companions were well aware of what should have been done, applying the same methods that were used by the prophet himself, in deciding crucial issues. Thus, the Prophets closest companions, soon after his death, chose a successor to the Prophet as Head-of-State, based on consensus after consulting all shades of opinion. In other words, the companions of the Prophet adopted a form of democracy by consensus, in choosing Heads-of-State after the Prophet. This, system of democracy by consensus operated for the election of the first four successors or Caliphs, known as the Khulafa Ar-Rashideen, the rightly guided Khalifas of Prophet Muhammad. 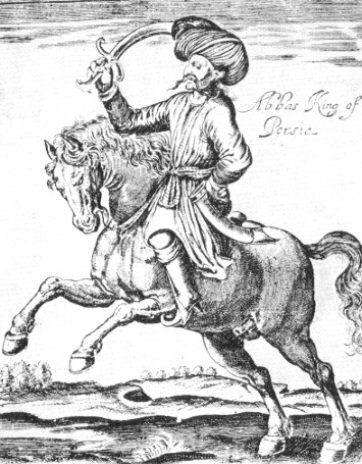 The conversion of the elected caliphate into a hereditary caliphate after the assassination of the 4th elected Caliph, Ali bin Abu Taalib, was an innovation, not strictly in keeping with Islamic principles, and hence the uncivilized behavior of Muslim monarchs resorting to murder of their own kith and kin, was a direct result of trying to perpetuate a system not provided for in Islam. 1) The Pearl Fisheries of the Persian Gulf - Chapter 6, The Book of the Pearl - George Frederick Kunz. 2) Famous Pearl Collections - Chapter 16, The Book of the Pearl - George Frederick Kunz. Copyright © .Internet Stones.COM. All rights reserved.